William Gilmore Simms, 1806-1870. Poems: Descriptive, Dramatic, Legendary and Contemplative, by William Gilmore Simms, Esq. In Two Volumes: Vol. I. I. Norman Maurice, a Tragedy; II. Atalantis, a Tale of the Sea; III. Tales and Traditions of the South; IV. The City of the Silent. Poems: Descriptive, Dramatic, Legendary and Contemplative, by William Gilmore Simms, Esq. 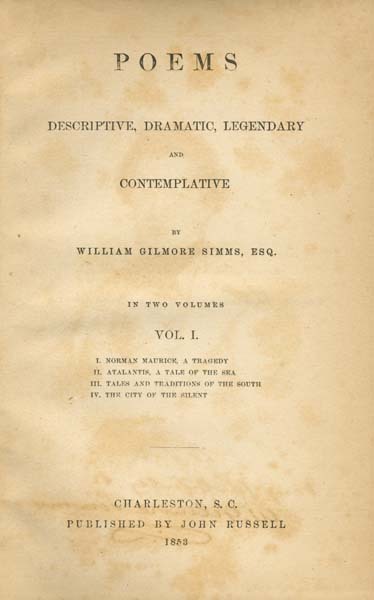 In Two Volumes: Vol. I. I. Norman Maurice, a Tragedy; II. Atalantis, a Tale of the Sea; III. Tales and Traditions of the South; IV. The City of the Silent. Charleston, S.C.: John Russell, 1853.